Samriddhi Charitable Trust runs our Bridge School at Nellurahalli. You may recollect the magical way that it was started and how successfully it is running for the last 2 years. 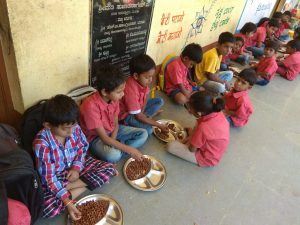 Here is yet another initiative that was highlighted to us by Mom Bannerjee of Samriddhi. Read the below in her own words. “Few Residents of my apartment Akme Encore wanted to volunteer. As we all know with the best of intentions, sustainable regular Volunteering is always a challenge!! To address this I came up with an idea of sending breakfast dabbas to our projects every day. Monday : Boiled brown chana with chat masala. T hursday : Oats Porridge. So the idea is every volunteer makes above break fast plan for their family and prepare a little extra to serve 5-7 kids. The menu has been kept the most simple so that no one need to put much effort.The result is phenomenal. Samridhdhi gave one dabba with 5-7 bowls and a steel milk can to each Volunteer. The dabbas were kept with the security by each Volunteer. The Samridhdhi school bus attendee picked up the bag while passing through. 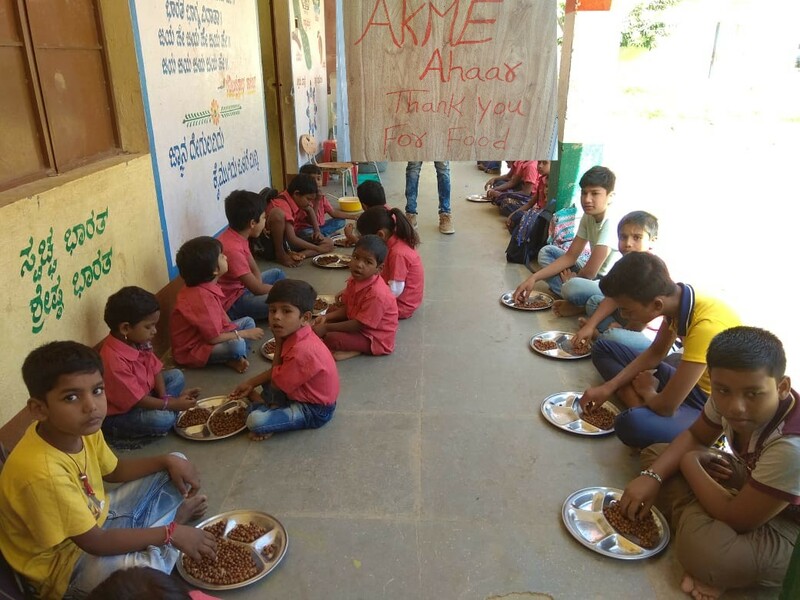 Samriddhi Trust identifies out of school children in slums, helps them enroll in their Bridge schools, and makes sure the children are provided with age appropriate literacy and numeracy in English, Kannada, Hindi and their Mother Tongue along with some basic knowledge in the form of EVS. After one year, the children are admitted in age appropriate grades in mainstream Private English Medium Schools or Government schools.